How can you learn 21st Century competence? Innokas Network aims to provide enablers for learning 21st century skills needed in day-to-day life in the digital society. 21st century skills include the ability to think creatively and critically, problem-solving skills, collaboration skills, the ability to conduct research and the ability to learn to learn. To reach their goals future adults also need motivation, must be able to use various tools and must possess the willingness to put into use the knowledge and skills they have learned. Innokas Network activity is based on the results of Educational Research on the competence needed in the 21st century and on the best practices for acquiring the competence. In its activity the network applies the latest research while also enabling the creation of new scientific knowledge through its coordination by the Faculty of Educational Science at the University of Helsinki. Innokas Network participants engage in grass-roots activity that is based on education research on Innovation Education. 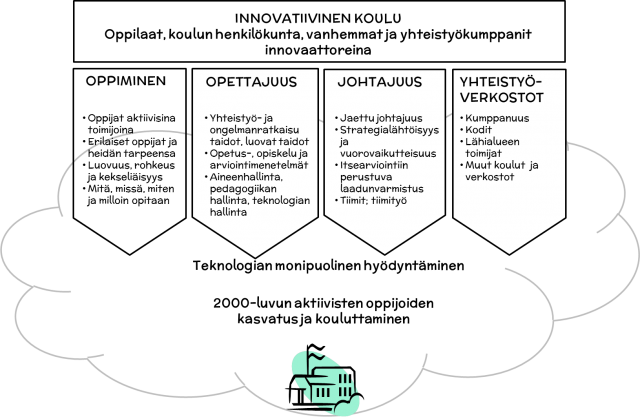 Innovation Education is a cross-disciplinary approach combining the Finnish tradition in Handcrafts and the Science, Technology, Engineering, Mathematics and Arts (STEAM) subjects with the methods of Digital Fabrication, hands-on activity and Technology Education. In the network activity children create Educational Innovations, inventions. The creative process primes the learners for learning 21st century skills. Examples of Educational Innovations include the creation of a dancing robot or an intelligent garment. A key guiding framework in Innokas Network activity is a model of an ideal school that optimally supports the learning of 21st century skills. The holistic Innovative School model consists of four areas that form the basis for school operations: Learning and Learning Environments, Teachership, Leadership and Partnerships. In the model school actors including students, school staff, parents and other collaboration partners act as innovators developing school operations. Examples of these innovations on school operations, or Operational Innovations include advances in team leadership, student-led break activities or student-tutor activity. By reflecting on the model, Innokas Network activity can focus on improving the factors that enable school transformation in a way that supports the learning of 21st century skills. The teaching of 21st century skills and supporting school transformation should be based on solid educational research. New research methods are needed in order to produce the required research knowledge in pace with the rapid digitalization of the society. Innokas Network research activity is predominantly based on Design Research, a research approach where the researcher is embedded in day-to-day school activity and takes an active part in guiding development activities performed by students, teachers and other school actors. By introducing research activity as part of the daily schoolwork in normal schools we can produce more meaningful research while also developing novel solutions that support the school with their daily challenges.